Today we celebrate Independence Day. And since I write about guns and gun violence, I am suggesting that we could also celebrate saving lives through common sense gun measures that won’t take away the freedom to lawfully own a gun. This freedom should be extended to those who are responsible and can prove they can be safe with their guns. And we can do this, much like other advanced countries have done. The fact that we haven’t is unique to America- and not in a good way. Reasonable people can put their heads together to reduce the daily carnage due to reckless and irresponsible gun use and ownership. So on this national holiday, consider common sense and common ground. I have included a meme in this post with some “language” but it gets to a point that needs to be made. Ray was charged with misdemeanor open carrying of weapons, the arrest affidavit said. Ray also did not have a concealed weapons permit, police said. The weapon had a 30-round magazine with a round in the chamber, police said. Ray said he was not trying to hurt anyone and is a big proponent of Second Amendment rights. He said if guns were everywhere, people would be more comfortable being around them. When a patron at the Burger King on North Atlantic Avenue asked Ray why he was carrying the gun, he replied that it was “to guard against all the crazies out there,” records show. Just when you thought you’d heard everything. 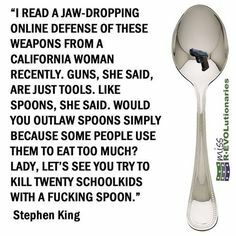 I guess the gun lobby has succeeded in so dumbing down the arguments about gun owning and carrying that even this seems to make sense to some. I don’t have to get into why a loaded gun with a 30 round magazine carried on one’s person is different from carrying a cup of coffee around do I? But this craziness is what gives some of the gun extremists their excuse for what they are doing. There is no excuse. Anyone with common sense understands that the average American is just not going to get used to people carrying assault rifles around where they live, play, work, learn, shop and worship. Why? Because in the real world, there are people carrying these things into the places where we are with our families who have shot and killed people. I don’t know about you but if I see someone carrying a cup of coffee around, I know for sure I won’t be killed by that person with the coffee in his/her hands. It is simply not normal for people to be carrying loaded assault rifles around in public. This July 4th holiday there are warnings out about possible ISIS attacks in America. Why wouldn’t a member of a terrorist or hate group also walk around on our streets with a loaded assault rifle in public places with evil intent? How will we know the difference? We also have our own “home grown” terrorists ready to commit heinous acts and hate crimes. Our country just experienced one of the most awful hate crimes in recent history in Charleston, South Carolina. It was one young man, loaded with hate, intolerance, racism and anger and also a loaded gun. Listen, the CDC is there to look at diseases that need to be dealt with to protect the public health. I’m sorry, but a gun is not a disease. And guns don’t kill people; people do. And when people use weapons in a horrible way, we should condemn the actions of the individual, not blame the action on some weapon. Listen, there are hundreds of millions of weapons in America. They’re there. And they’re going to be there. They’re protected under the Second Amendment. But people who use weapons in an inappropriate or illegal way ought to be dealt with severely. 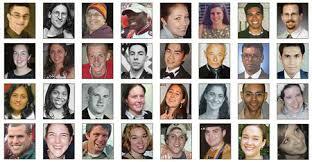 “I’m sorry but a gun is not a disease….” Really? Can we dumb down the conversation any more than this? You can almost see the strings attached to Boehner’s arms with the NRA’s Wayne LaPierre behind the curtain moving Boehner’s mouth. This is so ridiculous as to be unbelievable. But this is the unique American gun culture that we celebrate along with other American “freedoms” and ways of like. A gun is not a disease. It’s also not a cup of coffee. Or a spoon. But the mayhem and tragedy caused by people with guns is surely a disease in America. It is a public health epidemic that we are ignoring at our peril. What we can’t do is let elected officials get away with their nonsensical statements about guns and gun violence that belie the facts. And we can’t let people who are carrying loaded assault rifles around in public get away with their swaggering attempts to “normalize” what they are doing. They are a distinct minority who have been led to believe that they have a right to do this because… second amendment. This nonsensical reasoning is an insane interpretation of the amendment and does a disservice to the founding fathers who wrote our Constitution. Dr. Murthy is right. He is about changing the conversation in American. Gun violence and the toll it takes on our communities is very real. It’s not going away but we can at the least try to reduce and prevent some of it. Not to do so is unpatriotic. The thing is,we can have a gun culture and we can have guns. We have more of them than any other advanced country not at war. But we can also have common sense when it comes to regulating guns and their owners. Most gun owners are safe and use their guns for recreation and sport. But enough of them are not that we owe it to our American values to prevent them from shooting their own family members, or black people in a church, or movie goers, or young school children, or people who practice a different religion, or college students or people shopping in malls, or themselves….. And that would also be an American thing to do. This week-end we will be celebrating our country’s independence. It’s obvious that freedom and liberty mean different things to different people. I think we can all agree though that none of us want to be shot. Passing sensible legislation to keep guns away from people who should’t have them does nothing to take away the freedoms of those who do not have bad intent. But when the conversation is dumbed down and the research is blocked so that we can’t, as a country, deal with our public health epidemic of shootings, that takes away the ability to be free from devastating gun violence. The NRA’s approach to personal safety assumes crime can be prevented by ever-present fear. The instruction suggests that threats are everywhere beyond our front door, making the advice impractical for anyone interested in leaving her home. Rather than refusing to be a victim, the seminar can make one feel as though they’re always a victim. The impracticality of the NRA’s advice aside, its rules aren’t an effective way of preventing most interpersonal crime. The course suggests that, to avoid becoming a victim, you should fear strangers. But most violent crimes are committed by a relative, friend or acquaintance of the victim. Every piece of safety advice the NRA gave would be relevant only if the assailant was a stranger, and yet nearly two out of three violent crimes are perpetrated by someone the victim knows. Further, what epidemic of violence in public restrooms and hotel rooms justifies always employing a buddy system? Certainly, you can find news stories about crimes committed in these places, but generally, crime statistics show that public areas are safe. Just 12 percent of violent crimes are committed in commercial areas – including bars, gas stations and banks – and just 0.1 percent occur in hotel or motel rooms, according to federal data. Meanwhile, 43 percent of violent crime occurs in or near a familiar private residence, whether your own, a friend’s or a relative’s. The gun lobby is purposely hiding the facts or blocking ways to find them. I know for a fact that the gun violence that affected my family was committed in a home and committed by someone who knew and once loved my sister who was also a “law abiding” gun owner until suddenly he wasn’t. Should my sister have been more afraid of all of those monsters, zombies, felons or whoever is lurking in public bathrooms and hotel corridors than she was of her estranged husband? Mike the Gun Guy also takes issue with the NRA’s notion of gun safety. He wonders about the ASK campaign and the BeSmart program, both programs encouraging safe storage of guns. The reason? The NRA’s safety program wants people to have their loaded guns at the ready at all times. This just does not work when locking guns securely away from kids and teens. It’s a unique American conundrum but one that does not have to totally befuddle us and stop us from acting in the interest of public health and safety like virtually all other countries have done. What is the answer here? More guns are not making us safer. The gun lobby promotes more guns and in many cases, more loaded guns around wherever gun owners determine there is fear for their personal safety (everywhere). Where is the common ground? Clearly the conversation has to change in order to change our unique gun culture. On this July 4th holiday, let’s think about how that can happen. 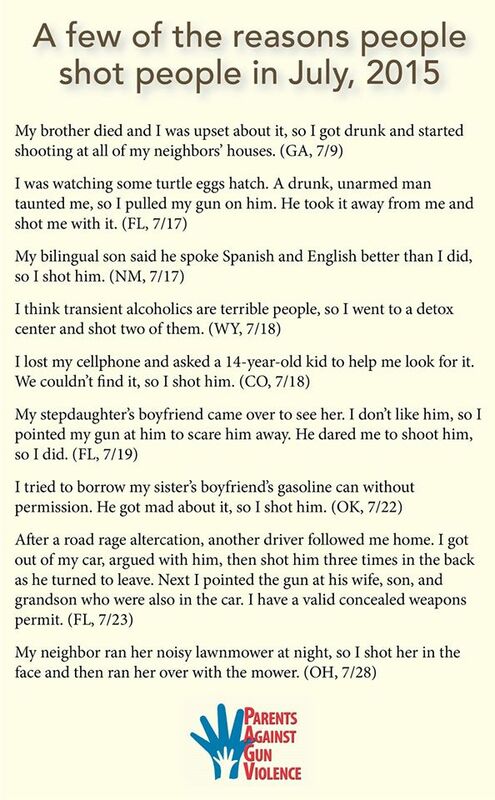 The incidents below are incidents involving “law abiding” gun owners. In no other country would these incidents be allowed or the people involved in them to have guns in the first place. A 90 year old Florida man was arrested for threatening someone with his gun. He was a “legal” gun permit holder who did not have his right to carry taken from him 5 years ago when he threatened someone else. He shouldn’t have had a permit or a gun. Was he in any kind of state to handle his responsibility with that gun and that permit? Luckily no one got hurt but is that the point? In America …rights trump public safety. A Vermont firearms instructor was seriously injured when one of his students shot him. The article does not mention if he was armed at the time. The woman was adjudicated mentally ill so couldn’t legally own firearms. But she could use a gun at a gun range because no background checks are required to shoot guns at a range in Vermont. This article is the “poster child ” for all that can go wrong in our unique American culture of guns. He tells Siouxland News he’s is doing this to show support for the first and second amendment. He says he’s been walking at least once a week since 2011, mainly in Le Mars, but he has walked in Sioux City and Iowa City. Cornish adds that all he sees in the media is negative stories and not much support for the first and second amendment, so this is a way for him to show support for the open carry law. It is time for opponents of gun control to stop mindlessly shouting “The Second Amendment! !” as if that ends the discussion. It does not. Just as there is no First Amendment right to falsely yell fire in a crowded theatre, there is no Second Amendment right to carry an AK-47 there. And that is only the beginning of what the Second Amendment does not guarantee. Extreme behavior like the one in the article above, using the excuse that the second amendment gives him the right, should not be tolerated by an America dealing with the epidemic of gun violence and racism that should be of great concern to us all. So on this Fourth of July, I urge you to think about how the world has changed since our Constitution was written and why we need to look at the enduring words written by the authors in the context of current reality. Stay safe out there. Beware of people carrying spoons and cups of coffee. You never know what might happen. And don’t catch the gun disease. Kalesan’s study defined “social gun culture” as a phenomenon in which friends or family would think less of you if you didn’t own a gun, and if your social life with friends and family involved guns. Any survey participant who answered “yes” to any of these statements was categorized as being part of social gun culture. Figuring out the dynamics at play in social gun culture, according to Kalesan, will be key to sparking social change about the attitudes and practices that inform gun ownership in the first place. She said educating Americans about the health dangers of having a firearm in their homes will change the way people feel about gun ownership, which in turn could drive laws that make guns more difficult to obtain.